- $20 Per Tipper – Cash Only. No Credit Cards Accepted. - Once the $20 has been received there can be no refunds under any circumstances. - 1st Place: $300 + 60% of money pooled. - 2nd Place: $200 + 25% of money pooled. - 3rd Place: $100 + 15% of money pooled. - Best Tipper of The Week (Determined by best weekly score) : MUST BE AT LEAST 6 GAMES IN THE ROUND TO WIN PRIZE. 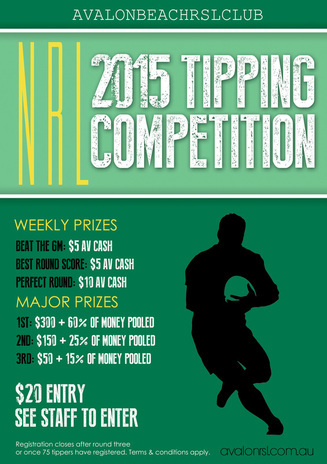 - If more than one person gets top weekly scores each tipster still receives $5 Club Cash. - Beat The GM: Win $5 Club Cash. To ‘Beat the GM’ the tipster must get a score a greater round (not equal) than what the GM achieved. - Tips MUST be in 30 MINUTES BEFORE THE FIRST GAME OF EACH ROUND If tips are not received by this time all ‘away’ teams will be automatically selected. In this case the most the tipster can win in the round is half the maximum possible points per round. Each player that supplies their email address will receive a reminder each week to provide their tips. 1) Completing the form in the Club and placing in the labelled entry box by the due time each week. 2) Go to the Avalon Beach Club website and make selections online 7:30pm by the due time each week. - Updated by midday Wednesday each week. Weekly Prizes can be collected by midday Wednesday each week. - Weekly prize winners & leader board displaying all players’ scores and current placing will be displayed on club noticeboard. - All of the above info will also be posted on the AVRSL website to be updated midday Wednesday each week. - State of Origin & International Games are NOT included in the tipping competition. - The Final Series are NOT included in the tipping competition. - The winner of the competition is the tipster with the highest score after 26 rounds. - If there is one or more people with equal winning scores at the end of the competition the total prize pool is split between these people. - Club Management will collate tips with supervision. - Staff are permitted to participate in the competition however they are illegible to win any weekly or major prizes stated above, there will be an in-house prize for the best staff tipster. Staff & member results will be displayed in conjunction however all staff members will be clearly marked. This is so we can have the fun of competing together each week! Due to illegibility of winning any prizes staff are not required to pay the $20 entry fee. - No further tippers will be accepted into the competition after the completion of round three. For each round they have missed they get the ‘away’ teams up to a max of 10 points per round. - Major Prizes will be available for collection 24 hours after the last game of the 26 rounds. - If for any reason a scheduled game does not go ahead – no points will be awarded for any selection made.